A First Folio at the Folger Shakespeare Library. Photo by Lloyd Wolf. Imagine a world without Macbeth, Twelfth Night, or Julius Caesar. We likely wouldn’t have half of Shakespeare’s plays without the First Folio. Who was responsible for making this book, the first collected edition of Shakespeare’s plays in 1623? And how exactly was it put together? On this episode of Shakespeare Unlimited, we hear from Emma Smith, professor of Shakespeare studies at Oxford University and the author of The Making of Shakespeare’s First Folio. Smith talks about the London print shop that produced the First Folio, 17th-century printing practices and copyright issues, the actors from Shakespeare’s company who collected the plays and the financial risk they were taking, and other aspects of the process for creating the book that gave us Shakespeare. One of the many things that Emma Smith talks about is the Stationers’ Register, which records the publishing rights for many of the works printed in England during this period. You can pore over the Stationers’ Register entries for Shakespeare’s plays on Shakespeare Documented, an online exhibition of primary-source materials that reference Shakespeare in his lifetime and shortly thereafter. This podcast episode is the perfect companion to the First Folio tour commemorating the 400th anniversary of Shakespeare’s death. Throughout 2016, 18 First Folios from the world’s largest Shakespeare collection, the Folger Shakespeare Library, are traveling around the United States. See if one is coming near you. Listen to another Shakespeare Unlimited podcast episode that takes you on a behind-the-scenes tour of the Folger conservation lab, where conservators prepared the First Folios to go on tour. 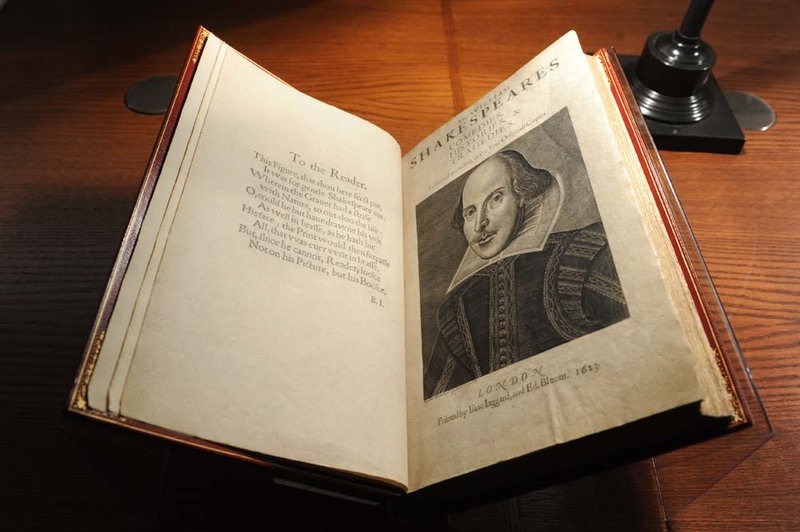 Want to flip through a First Folio? We have a digital version online. Enjoyable and informative. Fascinating information about the First Folio. Thank you. I am looking forward to seeing a First Folio when the tour comes to Las Vegas.